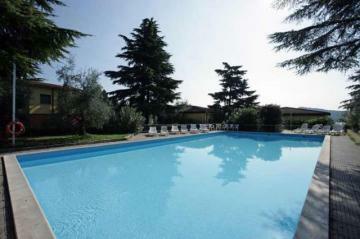 This apartment is part of a nice holiday park in Manerba del Garda, on the southwestern shore of Lake Garda. The park, which is located right on the lake, is surrounded by beautiful grounds and consists of a camping area and an area with several bungalows, villas and apartments. Guests of the park have access to the three swimming pools, one tennis court and a playground. Other facilities of the holiday complex include a small restaurant-pizzeria, a mini bar, a supermarket and a laundry. Thanks to its location, directly on the beach, it is ideal for a family holiday. If you would like to bring your motor boat there is a private jetty available at the dock. Manerba del Grada lies in the middle of Valtenesi Valley which extends to the great rock of 'La Rocca'. On this rock you'll find the ruins of Chateau La Rocca. From here you can enjoy a breathtaking view of the lake. In this environment you will also find vineyards, historic villas and picturesque villages. In Manerba you will find more than 11 kilometers of beautiful beaches. From the holiday complex you can take exciting trips to historic cities such as Verona and Venice. In summer visit the centuries-old Arena di Verona, where classical operas are performed. In the vicinity there are several markets which are also worth a visit: Salò San Felice del Benaco, Desenzano del Garda, Moniga del Garda, etc. In terms of recreation and sports you will certainly be attracted as there are many possibilities in the area including windsurfing, sailing, kite surfing, canyoning, mountain biking and horseback riding. This accommodation is spread over two floors and has an area of about 55m ². It can accommodate 4 to 6 people. The ground floor is a bedroom with double bed and a bathroom with shower and toilet. An external staircase leads to the first floor. On this floor is the living room with open kitchen and a separate bedroom and a bathroom with shower and toilet. The bedroom is furnished with a double bed. The kitchen, adjacent to the living room is fully equipped with a gas cook top with 4 burners, microwave, fridge / freezer and kettle (on request, the Italian coffee maker). These rooms feature a covered balcony and a garden with outdoor furniture. Each apartment is furnished in a modern and comfortable way and has air conditioning (only on the first floor), safe, TV with satellite connection and private parking. The price includes: - Gas / Water / Electricity - Use of the pool and accompanying furniture - Parking. - Heating is billed according to consumption at 1 euro per m³. - Final cleaning 40 euro. Upon departure you must leave the kitchen clean. - Sailing buoy 20 euro per day (reservation required). The tourist tax is compulsory from 14 years old:0,60 eur/pers/day. Guests of this holiday complex have access to a washing machine and dryer. Use of the washing machine is 6 euro per turn and the dryer is 2 euro per turn. The arrival time is from 5:00 to 7:00 pm. The departure time is between 8:00 and 10:00 am.